Having worked in radio for over 30 years, from being a DJ on the famous pirate ships in the 1970’s to running the largest commercial production company of the 1990’s Steve England’s experience of the British and American Radio industry is vast and his knowledge of jingle production in the UK and the USA is almost unequalled in Britain. Steve’s experience has left him with not only a great knowledge of the radio industry but also many anecdotes on dealing with clients and stations. 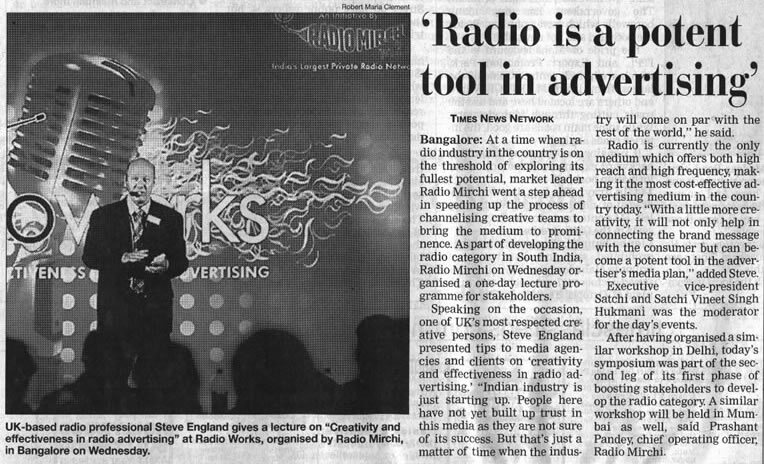 In October 2003 Steve was asked to take part in ‘Radio works’ a conference set up by some of India’s leading media to promote commercial radio advertising in India. 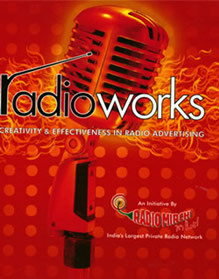 Commercial radio is in it’s infancy in India, having only been around for a few years. Steve put together a 5 hour show, including snippets of radio commercials and jingles spanning the past 40 years as well as interviews with the main people in the business. The conference was attended by many of the international advertising agencies, as well as local, national and international press. Steve was well received with many of the national media producing articles on Steve. Steve is available to lecture on radio advertising all over the world, whether to radio professionals or to the general public – bringing with him an impressive show, showing the highs and lows of radio advertising since the 1960’s, illustrating how radio is constantly evolving and how radio of the future may develop.